An avulsed tooth calls for a swift response and your quick action can dramatically increase the chance of long-term tooth survival. When a tooth is knocked out its blood and nerve supply is severed, but it can still be reattached if it receives proper care before a very quick trip to your dentist. What you need to know to maximise the chances of your child’s tooth being reimplanted, is the series of simple steps that Main Beach Dental shares in today’s post. Primary teeth: If the knocked out tooth is a primary (“baby”) tooth, it should not be replanted because of potential damage to the developing permanent tooth beneath it. Some parents are concerned about this for aesthetic reasons, but it is not worth the potential problems it can cause. 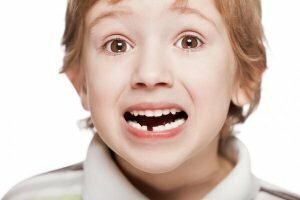 Permanent teeth: If your child knocks out a permanent tooth, the most important thing is to act quickly. Have the phone number of Main Beach Dental on your phone and call us immediately for an emergency appointment. If you take good care and get to our office quickly, there is a good chance you can save the tooth and have it reimplanted. Time is of the essence, because in order for the tooth to reattach, the cells at the tooth’s root must be kept alive. Stay calm. A knocked out tooth can be painful and traumatic. Children key in on the behaviour and feelings of their parents, so try to stay calm. Count to ten, take a deep breath, and follow the steps we present here. Pick up the tooth without touching the root. If you touch the root, you can damage the sensitive cells that make it possible for the tooth to replant. Clean the tooth with liquid. Use milk, water, or saline solution to rinse the surface of the tooth. Don’t use soap, chemicals, or alcohol on the tooth the tooth. Don’t scrape or scrub the tooth in any way. Don’t dry it out or wrap it in a cloth or tissue, as the sensitive cells on the root must remain moist to reintegrate with the gums. Replace the tooth in the socket. The sooner a tooth is back in the gum socket, the more likely it will survive. Be gentle and careful with the tooth. Use adjacent teeth to guide the placement of the tooth in the socket. Do not force the tooth into place – if it goes back in the jaw, great, if it doesn’t it becomes a matter for your dentist. Hold the tooth in place. Use your fingers, a clean handkerchief, a wet tea bag, or damp gauze to hold the tooth in place. If you can’t replant the tooth, have your child hold the tooth between the cheek and gum. If you have a young child who might swallow the tooth, hold it in a small container filled with milk, or the saliva of the child. Visit your Main Beach Dental dentist. Ideally, you should be on the road to our offices within five minutes of the accident. Call us from the road to prepare us for your arrival. While knocked out teeth and other dental injuries can’t always be avoided, the chances your child will lose a tooth can be dramatically reduced with just a bit of planning. Childproof your home with padding on sharp edges and stair gates at the tops and bottoms of staircases. Be certain that your child wears a helmet when biking or skating. If your child is athletic, they have to wear a mouth guard when playing sports. Main Beach Dental is happy to design a customised mouthguard for your child. Finally, keep your Main Beach Dental dentist’s emergency phone number in your cellphone.